Ships knocked down to save on shipping costs. See below for step by step instructions! Anodized aluminum frame for sleek lines. Wenge colored veneer finish on the MDF base looks just as good as natural dark wood finishes but a fraction of the cost! 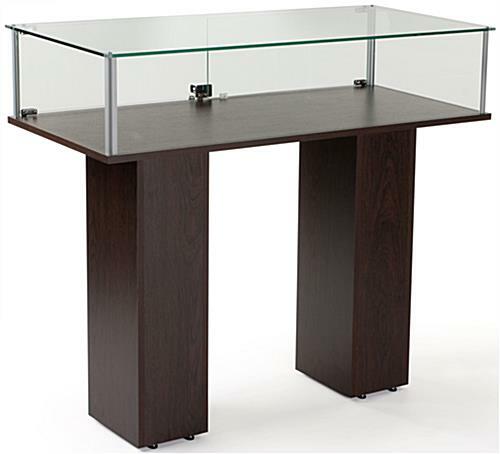 Tempered glass table top cabinet for a safer alternative to traditional glass. 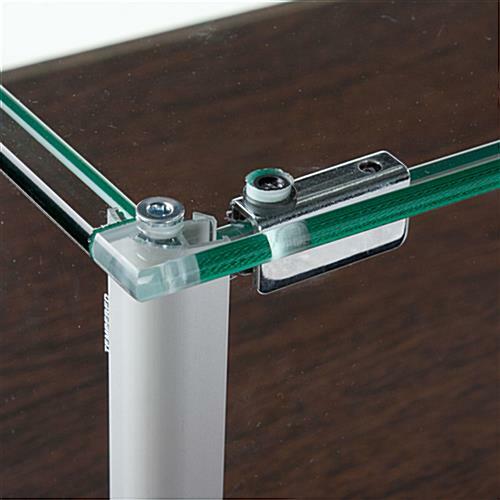 Locking glass doors to keep items secure and accessible to store owners and employees only. (2) Full width hinged swinging doors provide easy access to entire display surface. 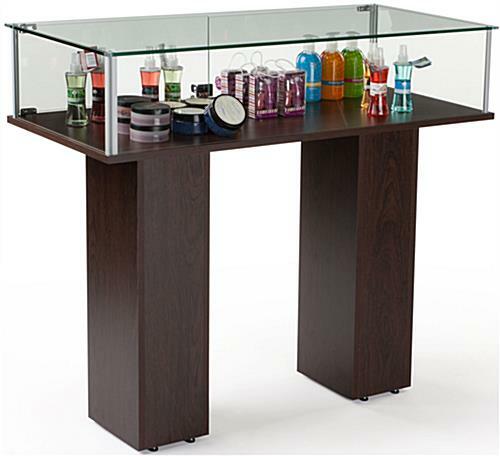 This commercial display case that has a pedestal glass table top is ideal for showing off special merchandise. 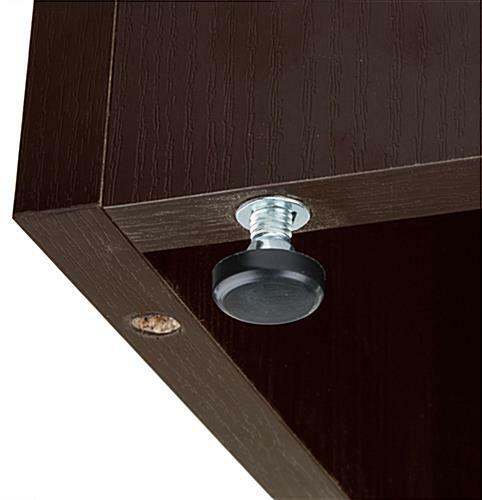 The anodized aluminum frame keeps the panels in place without detracting from the style of the store cabinet. 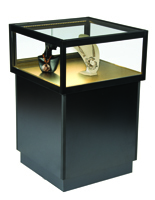 This tempered glass commercial display case, also known as a museum pedestal cabinet, has two doors that lock. 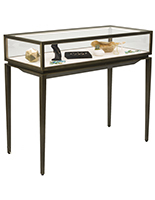 This showcase is great for a retail store to show jewelry, or a museum to place relics for visitors to see. This commercial display case has a wenge colored veneer deck so items really stand out against the dark finish. This pedestal store cabinet provides an unobstructed view of special items. 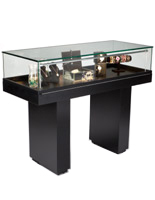 This commercial display case has two pedestal style rectangular legs that include adjustable floor levelers. This store or museum table has hinged swinging doors for access to items when needed. This pedestal showcase, commercial display case that ships unassembled is ideal in retail stores when used to line pathways. This pedestal cabinet for stores uses the tempered version of glass as compared to traditional annealed style for durablity and safety. This commercial display case that has a wenge finish on the MDF (medium density fiberboard) base looks just as good as natural wood finishes. The included floor levelers on the pedestal legs ensure that this store cabinet can be used in virtually any establishment! This stylish commercial display case has a European design that matches flawlessly in nearly any décor. 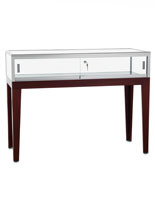 This contemporary glass table is 45" wide for ample space to place items. 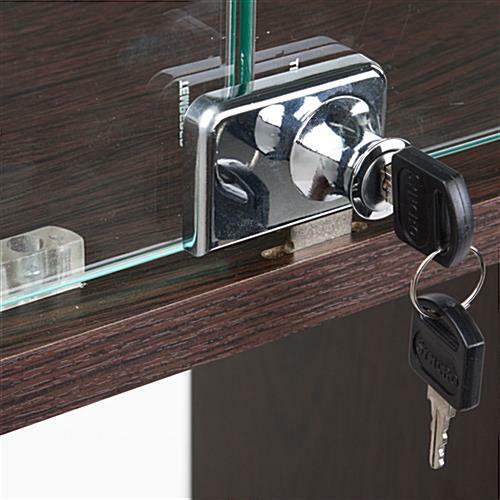 This commercial display case with a keyed lock is ideal for showcasing expensive items. 46.0" x 40.0" x 20.1"
8.0" x 30.3" x 10.0"
45.0" x 8.8" x 19.5"